1. Green People - Age Control Kit £33 vegan and cruelty-free // 2. Pamper Treat Smartbox by Buyagift £29.99 // 3. Field of Dreams - British Seasonal Flowers Bouquet by By Nature £39.95 // 4. Flower Shaker by Hema £3 // Engraved Gardening Tool Set from I Just Love It £24.99. I feel pretty lucky to have my mum and dad. I can honestly say that not much would get done in my house without them. My dad can fix pretty much anything with only a moment’s notice (without even checking YouTube to see how to do it. How does he know things without YouTube?) and my mum is always helping out with one thing and another. I always feel better after a visit from my parents. The house is arguably more organised after my mum leaves, I’m well fed and Ebony is content after an afternoon of games and fun with her grandparents. It’s hard to explain just how much I appreciate everything they do for me, and I know that life would be way more difficult (and less enjoyable) without them in it. When I first had Ebony, I remember feeling like Mother’s Day was my day. I was a mother now and could reap the benefits of this day of celebration. But this year, it’s definitely my mum who deserves all of the attention. I might spend my days looking after my daughter, making sure she is happy, loved and healthy, but my mum is still doing all of this for me 29 years later. That’s quite the commitment to my well-being. 1. I’ve recently been busy researching vegan-friendly anti-aging skincare (30 is approaching) and found this one by Green People. It’s suitable for vegans and not tested on animals, making it a great Mother’s Day gift option. 2. Buyagift offered to send my mum a Pamper Treat Smartbox this Mother’s Day. It’s an easy way to treat someone you love to a spa treatment. All you do is order the box online, then the receiver gets to choose which treatment they would like and where they’d like to have it. There are plenty of different treatments and spa treats to choose from, so there’s bound to be something your mum will love. 3. You can’t really go wrong with flowers, can you? And By Nature pride themselves on providing organic, ethical flowers meaning you can stop feeling guilty about sending a bunch of flowers to your mum this Mother’s Day. The bouquet is made from British seasonal flowers, so you don’t need to worry about the air miles behind your bouquet. 4. If you’re looking for something cheap and cheerful this Mother’s Day, Hema is a great place to check out. I love this Flower Shaker, the packaging looks great so it will make a pretty gift. And it has the added benefit of beautifying your mum’s garden whilst also helping to attract wildlife to her garden. 5. My mum can usually be found in the garden. And if she’s not there, she’s probably in my garden planting bulbs with Ebony. I Just Love It kindly offered to send something this Mother’s Day and I immediately chose this personalised engraved gardening tool kit. It’s something I know she’ll get a lot of use out of and I love the fact it can be engraved with your own message. 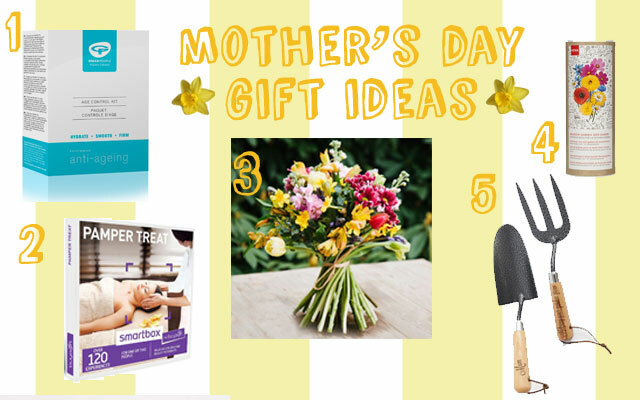 What are you getting your mother this Mother’s Day?